I think if they removed the grey cloud from the weather maps, that would be a step in the right direction. And then show where the cloud is via shadowing on the ground. As the old maps didn't show grey cloud - just light and dark patches on the ground - which is easier to see where the rain and everything else is then. 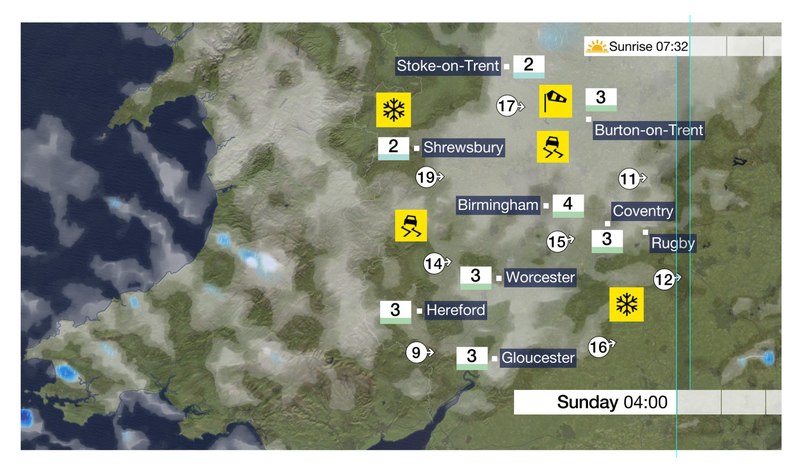 The cloud covers up the map too much - and then makes it difficult to differentiate from snow, cloud and fog then. Clouds are typically found way up in the sky – they're the white or grey fluffy things you see on a typical day. Snow is the white stuff that falls down from the sky and lands on the ground. ...I am able to tell the difference between these weather events in everyday life. Has anyone watched the new BBC Weather and then been able to easily recall what the weather is going to be like the next day? As a graphic designer myself, the alignment here really offends me! Bring back the old symbols! "John Kettley is a weatherman, a weatherman, a weatherman. John Kettley is a weatherman, and so is Michael Fish...... And so is Ian McCaskill..........."
Made it onto TOTP, if I'm not mistaken. The new BBC weather graphics look a bit mid 2000's to me. I always find graphics generally on the BBC to be a bit dated though. It's like they always seem to be about ten years behind everyone else. Especially Sport and News. ITV's weather looks current and contemporary. Just seen them on the TV for the first time. The black outline separating land and sea looks wrong to me - I presume it's so the country shows up if there's a lot of cloud cover etc, but it looks clumsy. Finding it strange that there have been no changes or improvements to BBC Weather graphics after over 4 weeks? I feel watching BBC Weather is so depressing these days with grey cloud and mist being shown on every single forecast filling the screen up and making it seem the UK never gets any sunny spells - rather than just showing shadowing on the ground like ITV and the Met Office do.